In 1960 the light was electrified and in 1962 a white concrete tower was built to replace the aged timber structure. Even in recent times reaching the island was so difficult that the keepers got mail only once a month, weather permitting. The light is now automated and has been de-staffed. Sources: Research Notes in ms., Admiral Hugh F. Pullen, Maritime Museum of the Atlantic. Lighthouses of Nova Scotia, David E. Stevens, Lancelot Press, 1973. In the early days, shipwreck survivors who managed to scale the rocky cliffs found no help for the island was uninhabited. When spring came, fisherman from the mainland would find frozen bodies huddled in crude shelters waiting for help that never came. Much publicity was given to the wreck of the Jessie. She was wrecked in a terrible snow storm and hand-written notes showed that some survivors lived for 10 weeks before exposure and lack of food took their toll. In 1832 the governments of Nova Scotia and New Brunswick set up rescue stations on the island. Demands were made for a lighthouse but nothing was done. One terrible night in 1835, a huge storm swept the Gulf and four ships were wrecked on the island's rocky shores. Finally, an act of the Nova Scotia Legislature in 1836 appointed commissioners for lighthouses on Scatarie Island (Off the coast south of Sydney, NS) and St. Paul Island. 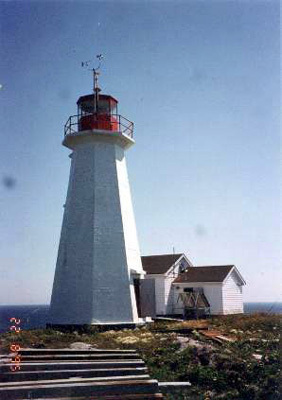 New Brunswick, Prince Edward Island, Lower Canada and Nova Scotia all contributed to the cost of the building and operation of the light, an indication of its importance to shipping. The North Point light was first lit in December, 1839. It was a powerful flashing white light visible for 20 miles. The apparatus was equipped with both lenses and mirrors. In 1865 a fog bell and gun sounded every four hours. By 1868 the light was a 3rd order dioptric, and the octagonal timber building was painted white. In the next year it was changed to a first order dioptric with mirrors - 308 silvered glass reflectors - and one concentric lamp with six Argand burners. This complex apparatus must have kept the keepers very busy cleaning and polishing! In 1872 St. Paul Island, North Light, was equipped with a steam fog whistle. In 1911, this was changed to a diaphone in a white square wooden building near the lighthouse. In 1875 the light was downgraded to a 3rd order lens, but in 1890 it once again became first order once again, and remained so. This rocky island which rises bold in the sea north of Cape Breton Island, was named by explorer Jacques Cartier. The island stands directly in the path of ships using the Gulf of St. Lawrence. The north point is actually a detached pinnacle though from seaward it appears to be joined to the main island. 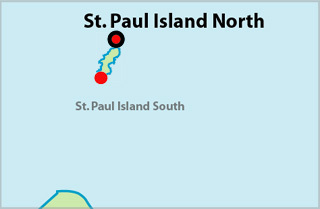 Because soundings give little warning, currents are variable, and fog is prevalent in these waters, Saint Paul was the site of many shipwrecks. Light Height: 140ft feet above water level. Tower Height: 046ft feet high. Light Height: 126ft feet above water level.